Since most military service members must deploy, many parents feel as though they are co-parents at least some of the time. Parents must make decisions about the well-being of their children while they are separated and sometimes these decisions don't come easily. Like all parents, they often make important and difficult decisions and compromises, but over a distance. Instituting a parenting plan before a service member deploys can help resolve many of the decision-making issues that may come up during deployments. Parenting planning isn't difficult, but it does take some time and thought. While a parenting plan may not cover all situations that occur during a deployment, it can help you make decisions based on other circumstances. Parenting plans are flexible; you may need to alter yours for each deployment, or when there is a change in family routine. While not all of the following topics apply to all military families, many will help you develop a useful parenting plan. Decide how your children will be disciplined so that when the service member deploys, the same type of discipline is still used despite one parent's absence. Some parents believe time outs are better than spanking, and some believe that rationalizing works just as well as both of those. Determining how to discipline your children so you stay with one plan of action whether there are two parents at home or only one shows your children consistency and stability, which is comforting to them. Many children want to engage in extracurricular activities such as clubs and sports. Discussing which activities your children are able to participate in will save a lot of strife when your children want to join something that the deployed parent may or may not approve of. If your children are at an age in which they can do chores and receive an allowance, it is best to discuss what the children can do and how much they should be paid for these chores. This is a factor not only in the family budget, but in the daily activities and responsibilities of each family member. Organizing visits with friends and family may be another section of your parenting plan. You may decide that your children will stay with their grandparents for a week and there are some rules you would like to send with them. Take this time to write down those rules so everyone knows what both parents expect. It may also be helpful to discuss friends and visiting arrangements to keep everyone busy during a deployment. Play dates are usually spontaneous, but if there are any problems with one of the friends, the parents should have this discussion together to decide what is best for their children. If your child has any medical problems, discussing what to do if something happens as a result of them or in case an emergency happens can help alleviate some of the stress during a crisis. Wondering if you made a good decision while your spouse is on deployment can be distressing; having a plan alleviates this. If your child is old enough to go away for spring break or summer camp, include the vacation plans. This way, everyone knows what the child is allowed to do, and what not. How much money a teen can have and what she can spend it on can be decided. Discuss who the chaperone will be. Arrange a meeting so that both of you can meet the chaperone; it will help disperse some of the anxiety the deploying parent may have when their teenager goes away. 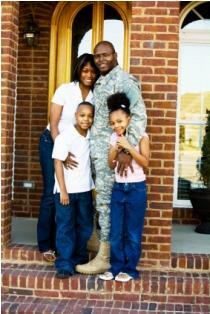 Include anything that comes to mind that you may have questions about while your spouse deploys. Having discussions face to face are much easier than waiting for video messages, emails and phone calls. Since these contacts are usually limited during deployment, keep these discussions focused on how everyone is doing and provide comfort to one another. A parenting plan helps you to have all these important answers before the spouse deploys, which means you can spend the majority of each video chat or phone call hearing news, good and bad, and just enjoying each other's company.